Some WIP's, FO's, and a little bit of pure genius. I have gone and done it again! So many things have happened over the past week and I haven't gotten round to posting about them yet, so this will be split into two parts, Knitting and purchases! 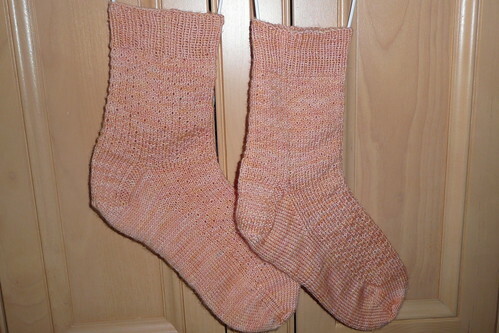 First up, I finished my Hermione Everyday Socks! Terrible Picture, taken quickly for the HPKCHC. I am really happy with them because they are much better fitting then the other pairs of socks I have knit, previously, I can actually wear these to work or something, which I did the other day! Problems: The small needles caused some problems with heat rash and every time it came to the heel flap I got a little confused because it is so fancy but I figured it out! Modifications: I only knit 12 repeats on the leg instead of 18 because I didn't think I would have had enough yarn but I have 38g left so could have gone to 16 repeats, I do prefer a shorter length though. Skills Learnt: Eye of partridge heel. Knit Again? : Possibly, but maybe with larger needles and less stitches, to reduce the likelihood of irritation. 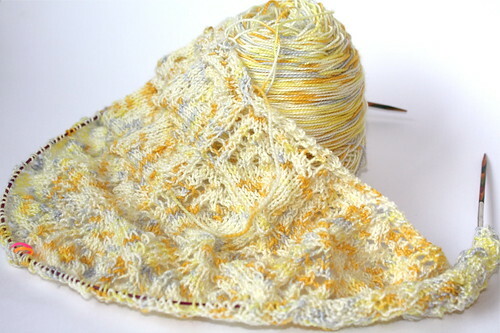 Now, speaking of progress made on WIP's, I have managed to get to my 4th repeat of chart 2 on my Bon Temps Marina Shawl. Isn't it looking pretty?! I have a close up of the pattern too because it is so difficult to tell what it is actually looking like and I love to check it every so often. 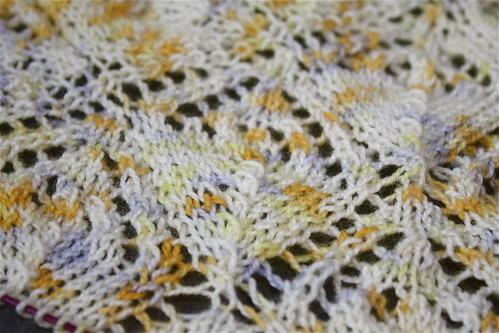 I adore how the colours are coming out on it too, It will look great when it is finished and blocked. Now, as much as I love this pattern, I have been having some problems, not with the pattern itself but with my own lack of chart reading skills. I have used charted patterns before but not a lot, and I find keeping track of where I am is just as difficult as reading the written patterns. 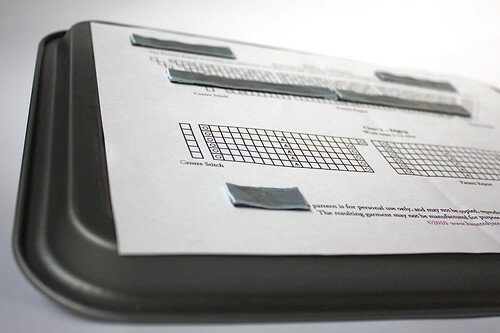 I contemplating dropping £15 on a Knit Pro Chart keeper, and then got an Idea. This tray is definitely not just for baking! I had some old magnets from Ikea which were too large for me to use on my whiteboard and so I took the magnetic strips off the back, cut them in half lengthways and hot glued some ribbon to the back to make them pretty. Add in a baking tray I had in the garage from university and BAM! My very own chart holder with magnets that I can move up a row as I go!